• Versatile mobile computer cart. 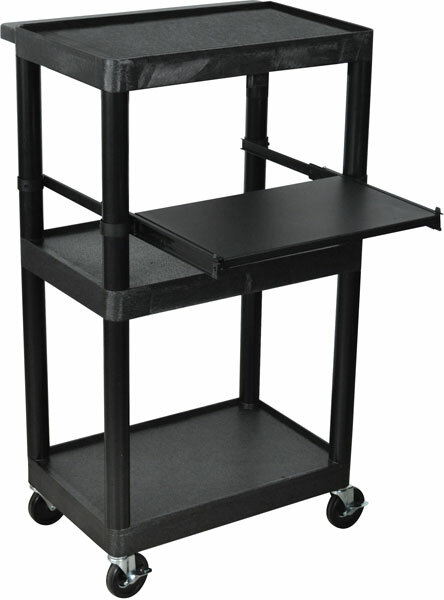 • This mobile computer cart includes an adjustable keyboard shelf which can also be used as a laptop shelf while using the top shelf for a projector. • This mobile projector computer cart is designed to be used at a convenient stand-up height. • Push handle is molded into top shelf. • ”Cable Track” cord management keeps cords neatly secured. • Includes 3-outlet, 15’ electric assembly. • 4” casters, two locking. • Includes Luxor Lifetime warranty.